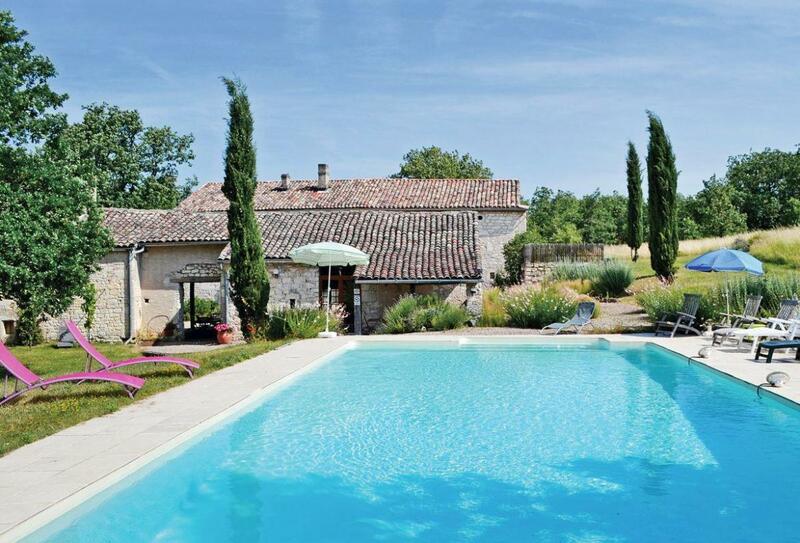 A charming and very spacious traditional stone built farmhouse with a separate guest cottage. Sitting amidst 20 acres of private lawned and wooded grounds that include a swimming pool (unheated), games room and excellent fenced hard tennis court. This is a real family house that has been lovingly renovated with great sensitivity, offering modern amenities whilst retaining many original features. The guest cottage is situated across the courtyard and faces the pool. Situated near to the village of Cahuzac, it is mid-way between the medieval towns of Cordes and Gaillac on the River Tarn in the heart of one of the major wine growing areas of the Gaillac appellation. Gaillac wines are internationally held in very high regard and there are ample opportunities for sampling and buying them in the towns of this lovely region. The Toulouse Lautrec Museum and magnificent cathedral in Albi are only a 25-minute drive. Toulouse on the River Garonne is also within easy driving distance and offers opportunities for concerts and cultural activities of all kinds. Main house: Ground floor: Step to kitchen with open fire. Dining room. Living room with French door to garden. Utility/WC. Large games room. First floor: Three bedrooms: One kingsize, one twin, one single with en-suite shower room/WC. Bathroom/WC with shower attachment and shower cubicle. Second floor: Sitting room. Double bedroom with two additional single beds (for children). Shower room/WC. Annexe: Living room with patio doors to terrace/dining area/kitchen area. Shower room (no WC). Separate WC. Two separate open-tread staircases to first floor: Two bedrooms: One kingsize, one twin. Private garden, covered terrace, outdoor swimming pool (12m x 6m, depth 1-2m, open Jun-Sep weather permitting) with Roman steps, oil central heating, open fire, washing machine, dishwasher, fridge/freezer, DVD, two CDs, wi-fi, cot, highchair, tennis court, table tennis, darts and small snooker table, ample parking, garden furniture, sun loungers, barbecue. Please note: Sorry, no hen or stag parties.